Author(s): Abhishek Kumar, Anita Bhandari, Sankaran Krishnaswamy. Department of Genetics & Molecular Biology in Botany, Institute of Botany, Christian-Albrechts- University at Kiel, Am Botanishes Garten 1-9, D24118 Kiel, Germany. Porins are integral membrane proteins found in the outer membrane of bacteria, mitochondria and chloroplasts. 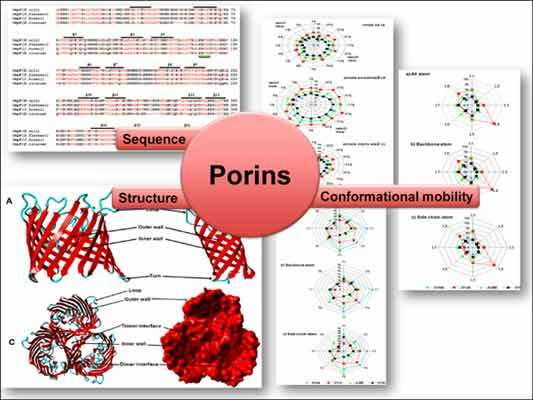 Herein, we have reviewed sequence and structural understanding about bacterial porins. The first porin structure from Rhodobacter capsulatus at 1.8 Å resolution in 1991 till the recent structural advancement, coupled by immunological properties, diffusion and ion permeation has been taken into account In the later part, we have presented our computational analysis of conformational mobility in selected porins. Atomic B-factors (in crystal structures) are indicative of the degree of intrinsic mobility associated with residues and secondary structural elements of a particular protein. We have explored and extended the intrinsic motilities within porins using selected six porins structures. These six porins were collected from PDB and B-factor analyses were performed using AWK scripts. Distributions of residues and mobilities were characteristic of different porins. These distribution patterns follow the level of homology at the sequence and structural level. The inner walls constituting the trimer interface were found to be more rigid than the outer walls. These mobility differences are intrinsic structural components of these porins. Keywords: B-factor (atomic temperature factor), β-stranded porins, conformational mobility, membrane proteins, porins. Affiliation:Department of Genetics & Molecular Biology in Botany, Institute of Botany, Christian-Albrechts- University at Kiel, Am Botanishes Garten 1-9, D24118 Kiel, Germany. Keywords:B-factor (atomic temperature factor), β-stranded porins, conformational mobility, membrane proteins, porins. Abstract:Porins are integral membrane proteins found in the outer membrane of bacteria, mitochondria and chloroplasts. Herein, we have reviewed sequence and structural understanding about bacterial porins. The first porin structure from Rhodobacter capsulatus at 1.8 Å resolution in 1991 till the recent structural advancement, coupled by immunological properties, diffusion and ion permeation has been taken into account In the later part, we have presented our computational analysis of conformational mobility in selected porins. Atomic B-factors (in crystal structures) are indicative of the degree of intrinsic mobility associated with residues and secondary structural elements of a particular protein. We have explored and extended the intrinsic motilities within porins using selected six porins structures. These six porins were collected from PDB and B-factor analyses were performed using AWK scripts. Distributions of residues and mobilities were characteristic of different porins. These distribution patterns follow the level of homology at the sequence and structural level. The inner walls constituting the trimer interface were found to be more rigid than the outer walls. These mobility differences are intrinsic structural components of these porins.